I've made this interesting picture about Scrum. 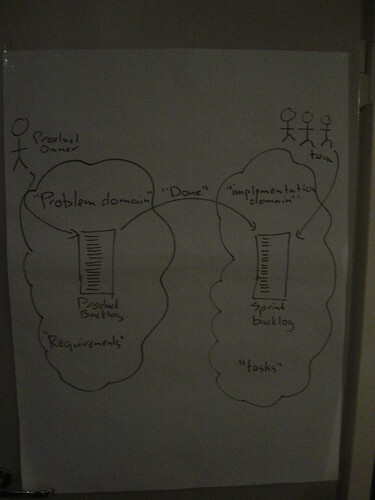 It shows the product backlog, product owner, sprint backlog, team and definition of "done" in one clear picture. I think I'll make it in a powerpoint and add to my standard training material. Someone pointed out this interesting research report from Microsoft Research about TDD. The research report claims that TDD results in higher quality, but that it also results in an increase in development time. This sounds rather surprising and weird to me. When reading the article, however, a few lines are kinda weird. They seem to suggest that they use TDD, the microsoft way. This means, write all test cases and then implement all of them, which is a huge misunderstanding of what TDD is and how it works. "The projects also took 15% extra upfront time for writing the tests"
In the conclusion: "while the development of both systems utilizing TDD took extra time upfront"
These sentences make the report very uncredible. Last months I've been involved in an agile project that runs in 2 week iterations. Of course, at the end of every iteration we hold an iteration retrospective. These have been extremly productive. 3 weeks ago we selected a "theme" for the retrospective instead of looking back on the iteration. That way we found some innovative actions to be done. It was useful. "4 weeks is too long back, 2 weeks is already difficult"
"When a new iteration starts, we reset our brain so we forgot all the things that happened before that"